Only 33 voters had cast a ballot by the end of the day on Friday, the second day of early voting in Oconee County for the Aug. 10 Democratic and Republican party primary runoffs. The counties were given leeway on when they started the early voting, based on their ability to get the ballots organized, and 13 voters had cast their ballots on the first day on Thursday. Early voting continues through this week at the office of the Oconee County Board of Elections and Registration, next to the courthouse. Republican voters have a lot more reason to turn out for the runoff than do Democrats. The Republican runoff ballot is headed by the contest for the nomination of the candidate for governor between Nathan Deal from Gainesville and Karen Handel of Alpharetta. Republican voters also have the chance to pick between Sam Olens of Marietta and Preston Smith of Rome for attorney general, Ralph Hudgens of Hull and Maria Sheffield of Atlanta for commissioner of insurance, and John Douglas of Social Circle and Tim Echols of Athens for public service commissioner. Democrats only have the contest between Gail Buckner of Jonesboro and Gorganna Sinkfield of Atlanta for secretary of state. Voters who did not cast a ballot in the July 20 primary can vote in the runoff and can ask for either ballot. Those who voted on July 20 must pick the same party ballot for the runoff. Real Clear Politics lists only one poll of Georgia voters–by Rasmussen–from after the July 20 primary, and that shows Handel beating Democratic gubernatorial nominee Roy Barnes by 1 percent and Deal beating Barnes by 6 percent. That difference gives Democrats and Republicans who sat out the July 20 primary as well as those Republicans who voted, a reason to register their preferences. With no local elections on the Oconee County ballot, however, turnout is likely to be light. In 2008, with a runoff in the Oconee County Republican coroner contest and for U.S. Senate in the Democratic primary, 13.5 percent of the county's voters participated in the August voting. 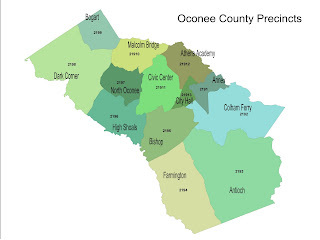 According to the official Statement of Votes Cast for Oconee County completed on July 26, Oconee County had 22,225 registered voters on election day on July 20. Fran Crowell from the Oconee County Board of Elections told me before the election that 2,111 of those were designated as inactive, meaning they had not voted in recent elections but could not be stricken from the rolls. Of those registered voters, 6,628 cast a ballot on July 20. That’s 29.8 percent of the registered voters or 32.7 percent of the active voters. The 29.8 percent figure falls between the 24.4 percent turnout figure for 2006 and the 36.4 percent turnout figure for the July primary in 2008. Oconee County went to staggered terms for election of members of the Board of Commissioners and Board of Education this year, and the increase in turnout suggests the local elections helped boost participation. Of the 6,628 voters, 5,804 (87.6 percent) asked for the Republican ballot and 824 (12.4 percent) asked for the Democratic ballot. In July of 2006, only 65.5 percent of the 4,145 votes cast were in the Republican primary. It seems likely the local Republican races, and the lack of any primary competition locally for Democratic candidate Carter Strickland for the Board of Education Post 2 position and for Suzy Compere for the Georgia State House 113th seat, increased the participation in the Republican primary. In 2008, the Democratic Party did not have any local candidates running in the July primary. For that primary, 90.1 percent of the 6,975 ballots cast in Oconee County were in the Republican primary. Turnout was relatively consistent across the county’s 13 precincts. It was highest at 33.6 percent at Annex, in the center-east of the county, and lowest in Bishop, at 24.8 percent, in the center-west. These figures are with the absentee and early votes reallocated to precinct. This reallocation was done for the Statement of Votes Cast for Oconee County but not for the initial returns released by the Board of Elections and Registration. Voters can and do skip races, but the local race for the 113th House Seat in the Georgia General Assembly got votes from 5,582 of the 5,804 Republican voters. In the county's 13 precincts, Hank Huckaby got 46.8 percent of the vote, compared with 34.3 percent for Tommy Malcom and 18.8 percent for Kirk Shook. The 113th District is made up of 25 precincts, and with the Clarke, Morgan and Oglethorpe county precincts included, Huckaby got 50.9 percent of the vote, avoiding the Aug. 10 runoff. The 5,582 votes cast for the 113th race were more than the 5,570 cast in the Republican governor’s race or the 5,413 in the secretary of state contest. The race between Mack Guest and Mark Thomas for Post 2 on the Oconee County Board of Education got 5,463 voters and the Post 3 Board of Commissioners race between Margaret Hale and Tammy Gilland had 5,431 votes cast. Hale got 51.8 percent of the vote to Gilland’s 48.2 percent. Thomas got 70.6 percent of the vote and Guest got 29.4. Gilland carried three precincts, Bishop (61.0 percent), Malcom Bridge (55.8 percent) and Athens Academy (51.7). Guest didn’t carry any precinct, but he ran strongest in his home precinct of Athens Academy (45.9 percent) and did worst in Antioch (16.9), where Thomas’ parents operate Hot Thomas Barbecue.